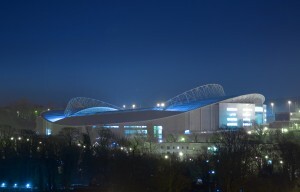 Blockbusters Contracts Limited recently carried out cleaning work at the Amex Stadium – home of Brighton and Hove’s Albion Football Club. The work included all internal waste pipes and drainage systems in the concourse and throughout the stadium. Even though the stadium is only three years old, fixing the extensive drainage systems was a big job for our team of experts. As approximately 30,000 people attending to each home game, it came as no surprise that the drainage systems needed cleaning. We thoroughly cleaned internal systems using electric cabling machines to remove all scale and before flushing through, while the external drainage systems were flushed through using specialist high pressure water jetting equipment. As with all football stadium maintenance work, the job needed to be scheduled in before the 2014/15 football season commenced. All works were completed by Wednesday 30th July for the first match of the season on Thursday 31st July. Blockbusters have an experienced team of plumbers and engineers who are ready 24/7 to help with your plumbing issue. We have a team of friendly, professional plumbers across the South East who carry the latest equipment to provide the best solutions for your plumbing or drainage problems. If you would like further information about Blockbusters, please call us free on 0800136658.